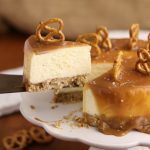 Layers of crisp sweet n' salty pretzel crust, rich creamy vanilla cheesecake, homemade caramel and a sprinkle of sea salt. A decadent dessert made right in the Instant Pot! 16 oz cream cheese room temp. Combine crushed pretzels, sugar, and flour together. Add melted butter. Using a fork, mix until dry ingredients are moist and will hold together. Press mixture into parchment-lined 7-inch springform or cheesecake pan. Set aside until cheesecake mixture is ready. Lightly beat cream cheese to break up. Add sour cream and sugar. Blend for 20-30 seconds. Add eggs, vanilla extract, salt, and cornstarch. Beat only until combined - don't over mix. Pour cheesecake mixture into prepared pan (over pretzel crust). Carefully tap pan onto counter or table to release any large air bubbles. Place wire rack in bottom of Instant Pot. Add 1 cup cold water. 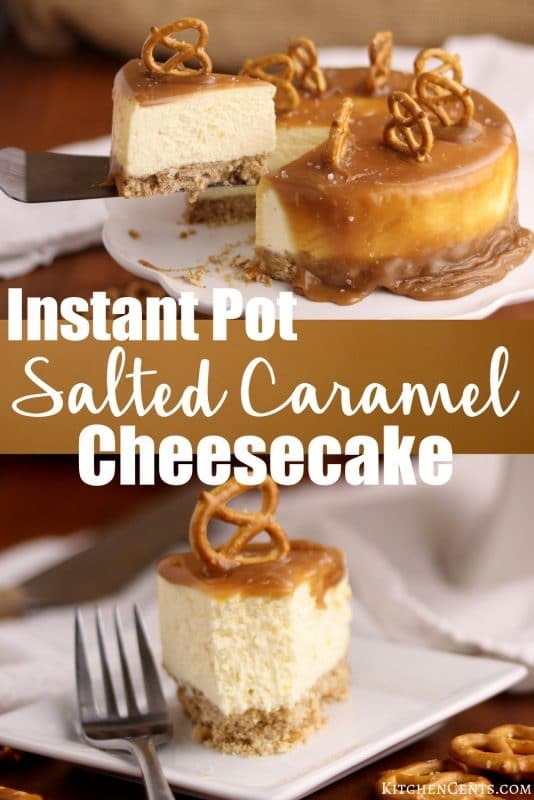 Using a tinfoil sling, carefully lower cheesecake into Instant Pot. Secure lid and set pressure release to close. Cook cheesecake for 30 minutes using manual HIGH pressure. When timer beeps turn Instant Pot OFF. Let cheesecake natural release (depressurize and cool without manually releasing pressure). This will take 10-20 minutes. Once pressure has released, open lid carefully without dripping condensation from lid onto cheesecake. Gently dab top of cheesecake with a paper towel to remove liquid that may be on the surface. Remove and set on wire rack to cool. 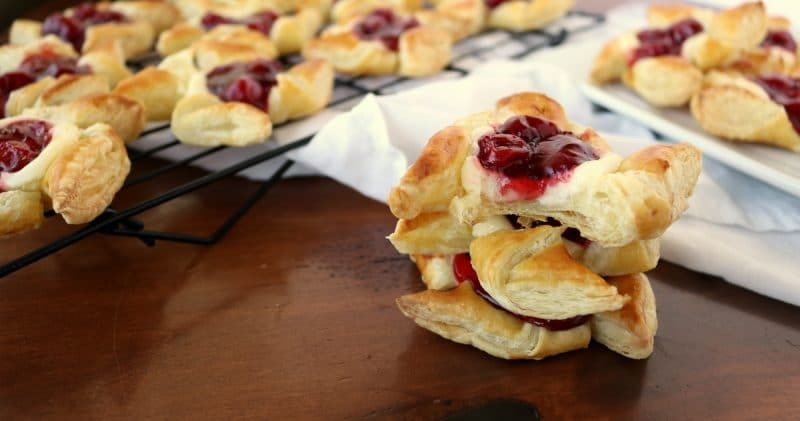 Once it has cooled to room temperature, refrigerate for 2-4 hours. This will help it become firm. Once the cheesecake has become firm, carefully add softened caramel to top. Try this amazing homemade caramel recipe or use store bought caramel squares (14-15 caramel + 1 Tbs cream to soften). Sprinkle caramel with coarse or flakes of sea salt. Use a warm clean knife to get smooth cuts through the caramel and cheesecake. Need a CARAMEL RECIPE? Find my favorite one HERE! my mouth is watering just thinking about this! so good! Hi Morgan! This cheesecake is mouthwateringly good and next time you come to visit I own you this! 🙂 Love you! I would totally do the same if I thought my family would make this cheesecake for me. HAHA!